Our educational audio equipment can be found in schools and nurseries all over the UK. 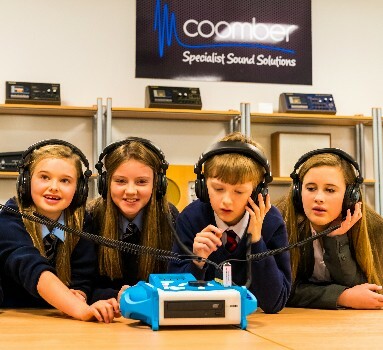 For over 100 years passionate teachers have trusted and used a Coomber! Our portable CD players and iPad listening centres are specifically made for English, Modern Foreign Languages and Music classes. They are the perfect fit for schools and nurseries looking for reliable and easy to use equipment. Our powerful portable amplifiers will help you amplify sound or reinforce speech easily. You can use them in static situations or where mobility is needed, with wired or wireless microphones, additional speakers for more volume and you can use them to amplify laptops, tablets and smartphones. In successful schools good use is made of specialists from English, languages and other subjects to support the development of effective strategies. The benefits of using Coomber products have proved to accelerate learning and allow pupils to engage with the subject and gain confidence which leads to enjoyment. It is well known that pupils who liked learning language perform significantly higher in listening and reading. We work closely with all levels of your profession and listen very carefully to your needs. We then use our expertise to give you the valued and trusted educational equipment as our part of the solution. In recent discussions with school improvement officers we are told that by learning from each other, identifying and sharing good practice is a key to a schools success as all teachers are likely to be enthused about something that works and that could be transferred to their subject areas. We have endless proven testimonials and lesson plans we would love to share with you. Many of the imaginative programmes to encourage reading which inspectors see are inspired by the ideas of a good teacher and many of them are noted to include the use of a reliable Coomber listening station.